Serve one of these roast beef recipes on your next party menu and you will be considered one classy host! Pair these simple yet spectacular roast beef recipes with a hearty red wine or Champagne, of course . Deciding when a piece of meat is done is a decision between great flavor and texture and food safety. Health authorities recommend cooking beef to 160°F to kill pathogens and other nasties in the meat. That much heat forces the juices from the meat and leaves it tough and chewy. So, home cooks must decide which matters most, flavor and juiciness or maximum food safety. For perfect doneness, use a meat thermometer and cook to 5 to 10 degrees below the desired temperature. Remove beef roast and let stand for 10 to 15 minutes. In that time the temperature will rise about 5°F to reach the desired doneness. This resting period also allows meat juices to reabsorb into the roast. A tri-tip roast is a boneless cut of beef from the bottom sirloin. Look for its characteristic "triangular" shape. This lean and tender cut is best dry roasted, grilled or broiled and will become tough if overcooked. Leave excess fat on while cooking to keep the meat juicy and flavorful. Trim fat before serving. Mix all ingredients together. Place ingredients in freezer weight plastic bag. Add tri-tip to bag and secure tightly. Refrigerate and let marinate 8 to 24 hours. Prepare a grill. 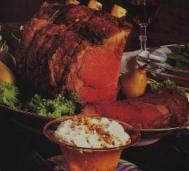 Place beef roast over medium heat for 30 to 35 minutes, depending on desired degree of doneness. Carve the roast against the grain. Heat oven to 325°F. Combine parsley, thyme, oil, garlic and black pepper; press evenly onto all surfaces of beef roast. Roast in 325°F oven 1-1/4 to 1-1/2 hours for medium rare doneness. Meanwhile combine sauce ingredients in small bowl; cover and refrigerate. Remove roast when meat thermometer registers 140°F for medium rare. (Do not overcook.) Transfer roast to carving board. Tent loosely with aluminum foil and let stand 10 to 15 minutes. Carve roast into thin slices. Season with salt and pepper as desired. Serve with sauce. Heat oven to 425°F. Rub the beef roast with olive oil. Combine seasoning ingredients. Press seasonings into meat. Place roast on rack in shallow roasting pan. Do not add water or cover. Roast 30 to 40 minutes for medium rare; 40 to 45 minutes for medium doneness. Rub trimmed fillets with the olive oil. Season with the salt and pepper. Place in a dish and sprinkle with the shallots. Let sit at room temperature for about 1 hour, turning at 30 minutes. Place all ingredients in a glass jar. Place on lid and shake well. Spoon over beef slices. Best at room temperature. Prepare sauce: Using electric mixer, beat cream, horseradish, lemon juice and sugar in bowl to medium peaks. Season with salt and pepper. Continue beating until firm peaks form. Prepare beef: Preheat oven to 425°F. Place beef in roasting pan. Spread 3 tablespoons mustard over. Roast 45 minutes. Cover loosely with foil; continue roasting until meat thermometer inserted straight down from top into center registers 125° F for rare, about 1 hour 5 minutes. Horseradish cream can be made 4 hours ahead. Cover and chill. Roast a whole cut of beef and thinly slice. Serve beef slices with a variety of accompaniments and allow guests to prepare their own canapés and appetizers.